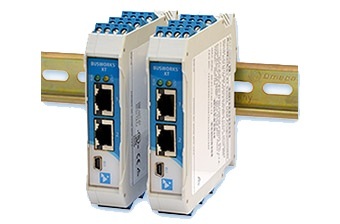 Designed to offers an isolated Ethernet network interface for up to sixteen single-ended current input channels Which enable a higher channel density to save space and a lower cost per channel. • Low input impendance (27 ohms) reduces loading on current loops. • User-configurable sample averaging (1-200) on a per-channel basis. • 10ms network updates for all 16 input channels. • High-resolution 16-bit Σ∆ A/D converter ensures precise, high accuracy measurements. AC current sensor (toroidal transformer). Converts 0-20A AC to 0-11.17mA DC. DIN rail strip, Type T, 3 inches (75mm) or 16.7 (425mm).